Key ingredients are flour, sugar, baking powder, egg beaters, milk, salt, butter (or oil) and vanilla. You can introduce any other ingredients as you’d like, although keep in mind that the more ingredients you have, the more complex the recipes will be and the more you’ll need to prepare for the activity. Management of the ingredients will be easier if they are divided into several cups, with teams sharing these cups of ingredients. Make sure to label the cups properly—sugar and salt can look very similar! If you don’t have an oven, use 2 or 3 toaster ovens. Several cupcakes can bake in a toaster oven at once. Make sure to use the foil cupcake cups if baking with toaster ovens, since a cupcake tin won’t fit in the toaster. See Suggestions (Under “Make it Better”) for how you can do this activity using mini aluminum loaf pans (found in any grocery store) so that teams have their own mini cakes. The instructions that follow are for using cupcake tins. Ask children if they have ever baked before. What kind of food did they make? Did they ever invent their own recipe? Tell them that they will be inventing a recipe for cupcakes, and then brainstorm a list of ingredients they might use. Once you have a list, show them the ingredients they’ll use to make cupcakes. Can you make delicious tasting cupcakes from scratch without using a recipe? Separate children into teams of 2 or 3. Distribute materials so that 2 teams are sharing a set of ingredients. 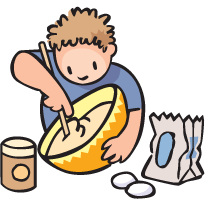 Suggest to children that they first measure the dry ingredients into a bowl (including the butter, if using), and then add the wet ingredients. They will measure everything in spoonfuls, or with measuring spoons. Allow children to use whatever proportions of ingredients they think are appropriate, but show them a cupcake tin, and let them know that however much batter they make, they’ll only use ¼ cup of it to make their cupcakes with. While they are mixing their recipes, preheat the oven to 350 degrees. Once all teams have made batter and are ready to bake, place the baking cups into the cupcake tins (if using a large oven), and have each team measure out ¼ cup of batter to place in their baking cups. If using toaster ovens, have teams simply scoop ¼ cup of batter into the foil tins. Place all of the teams’ cupcakes into the oven at the same time. Bake the cupcakes for approximately 15–20 minutes. Some ovens may take a little longer, some a little less time—keep an eye on them! Use toothpicks to test whether the cakes are done or not—poke a toothpick into a cupcake that looks like it may be done and pull the toothpick out. If it comes out of the cupcake dry, the cake is done. If batter sticks to the toothpick, it needs to bake a little longer. While the cupcakes are baking, bring your students together to talk about the process. How did they decide how much of each ingredient to add? How did they measuring their ingredients? Look for a discussion about “leveling off” the spoonfuls so that the measurement is consistent. What do they think each of the ingredients do in the recipe? After about 5 minutes of discussion, have each team look at their cupcakes through the glass of the oven or toaster oven. Bring them together away from the oven and continue the discussion. What do they notice after 5 minutes? What do they predict will happen after 10 minutes? 15? Once the cupcakes are done, carefully remove them from the oven to cool. Have the children look at their cupcakes and ask them to predict how they’ll taste. After 5–10 minutes of cooling, test the cupcakes to see if they are ready for tasting. Have the children taste the cupcakes and write down their observations. Bring them together to talk about their recipes, how their cupcakes turned out, and if anything surprised them. Look for cupcakes that look or taste very different, and compare their recipes. Use these recipes for a discussion with children about the role that the different ingredients in the cupcake batter might play. Ask your students what changes they’d like to make to their recipes if they were to make another batch. Make sure students are writing down recipes. This is especially important as you compare different recipes in order to have a discussion about the role of the different ingredients. Watch how the children are measuring their ingredients, and use this as a point for discussion later on. Are they “leveling off” their spoonfuls, or just scooping and pouring ingredients? Does this make a difference? You’ll need to be able to tell the difference among the different cupcakes when they are done baking—you can do this by having teams label the underside of their baking cups before pouring the batter into them, drawing a diagram of the cupcake tin that records whose cupcake is in which hole, etc. Brainstorm with the group as to how you could make this process of figuring out who each cupcake belongs to as easier. Traditionally this activity has been done with mini loaf pans (they measure about 6 inches long and 3.5 inches wide), which are made out of aluminum and are disposable. Most grocery stores carry them, and the advantage to them is that teams can have their own cakes. Three of these pans will fit side-by-side in a toaster oven. Now that kids have baked their first cakes, over the next week or so you should try all of the other Cupcake Science activities, starting with Cupcake Science – The Fizz Factor. Sugar helps sweeten, tenderize and moisten the batter and helps with browning. Baking powder and milk or water react together to create bubbles—these bubbles are trapped in the batter, and make the cupcake lighter and fluffier. Eggs are a “binder”—they help hold the batter together. They also provide aeration, moistness, flavor and tenderness to the cupcakes. Flour is the main ingredient of the batter and provides the base for the cupcake. Butter or oil provides flavor, tenderizes the batter and helps provide volume.